Kick your day-to-day commute up a notch and slide into the driver's seat of the affordable, athletic and fun-to-drive Mazda CX-5 crossover. 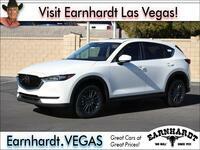 With the debut of the 2018 Mazda CX-5 in Las Vegas, NV, the wildly popular Mazda CX-5 is more attractive, more efficient and more advanced than ever before. Class-exclusive technology, an affordable price tag, a power-packed engine, a wealth of standard technology and much more make the 2018 Mazda CX-5 a class leader in the compact crossover segment. Families who would like to add a little pizzazz to their next adventure will love what the 2018 Mazda CX-5 brings to the table. Mazda CX-5 models are available in three well-equipped trim levels – Sport, Touring and Grand Touring – that will start at just $24,150. With room for five passengers in a cabin that adds 30.9 cubic feet of cargo space behind the second row that will expand to 59.6 cubic feet with the 40/20/40 split-folding rear seats laid flat, the Mazda CX-5 is perfect for daily errands. What Are the 2018 Mazda CX-5 Engine Specs and Features? 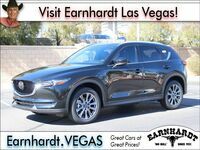 With a design that lends itself to an athletic performance, the 2018 Mazda CX-5 in Las Vegas, NV is a fan favorite at Earnhardt Mazda Las Vegas. When you slide into the driver's seat of the Mazda CX-5, you will enjoy the mechanical machinations of a 187-horsepower 2.5-liter SKYACTIV®-G four-cylinder engine. Married to a six-speed SKYACTIV®-Drive automatic transmission, the front-wheel drive Mazda CX-5 will earn 25 mpg in the city and 31 mpg on the highway. When equipped with Mazda i-ACTIV AWD®, the Mazda crossover improves performance and still makes 24 mpg in the city and 30 mpg on the highway. Manual-shift and Sport Modes allow drivers to upgrade performance at the touch of a button. Class-exclusive cylinder-deactivation technology is an added asset that will improve fuel economy when you are at cruising speeds. Drivers who have come to love the Mazda CX-5 will enjoy a wealth of high-end features and technology for the entry-level Sport trim. 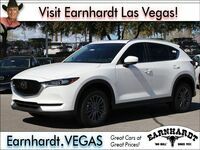 Mazda CX-5 Sport grades will feature standard LED headlights, 17-inch alloy wheels and a seven-inch MAZDA CONNECT™ infotainment system with Bluetooth. An available Sport i-ACTIVSENSE® Package will add High Beam Control, Lane Departure Warning, Lane-Keep Assist, Mazda Radar Cruise Control, Smart Brake Support, rain-sensing windshield wipers and automatic headlights. Additional upgrades for Mazda CX-5 trim levels include 19-inch wheels, a BOSE® 10-speaker sound system, a power moonroof, a power liftgate, an Active Driving Display head-up unit and more. 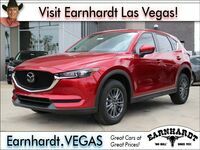 Visit Earnhardt Mazda Las Vegas today to get behind the wheel of the 2018 Mazda CX-5!